17C French Provincial Oak Commode. PRESENTING an ABSOLUTELY STUNNING Late 17th French Provincial Oak Commode. French furniture comprises both the most sophisticated furniture made in Paris for king and court, aristocrats and rich upper bourgeoisie, on the one hand, and French provincial furniture made in the provincial cities and towns many of which, like Lyon and Liège, retained cultural identities distinct from the metropolis. There was also a conservative artisanal rural tradition of French country furniture which remained unbroken until the advent of the railroads in the mid-nineteenth century. Furniture made in provincial centers such as Blois and Orléans in the Loire valley, and at Lyon or Liège (Not part of France politically but within its cultural orbit), followed at some distance the design innovations that were initiated in the luxury trades of Paris, often with a time lag that could amount to decades. Features typically associated with French Provincial furniture include cabriole legs, and simple scalloped carving. Dining chairs often have a wheat pattern carving reflecting the country surroundings of the maker. The ladder back chair with a woven rush seat is the typical French Provincial dining chair. Finishes vary though common to all colours is the accumulation of polish or grime in the carving over time resulting in an aged patina and emphasis on the carving regardless of whether the furniture is painted or stained. They were purchased by a Scotta Godwin/Obenchain from a French Antique Auction held at the Club Room in the Stoneligh Court (Hotel), Dallas on Wednesday the 2nd April 1930. (Now The Meridian Hotel). 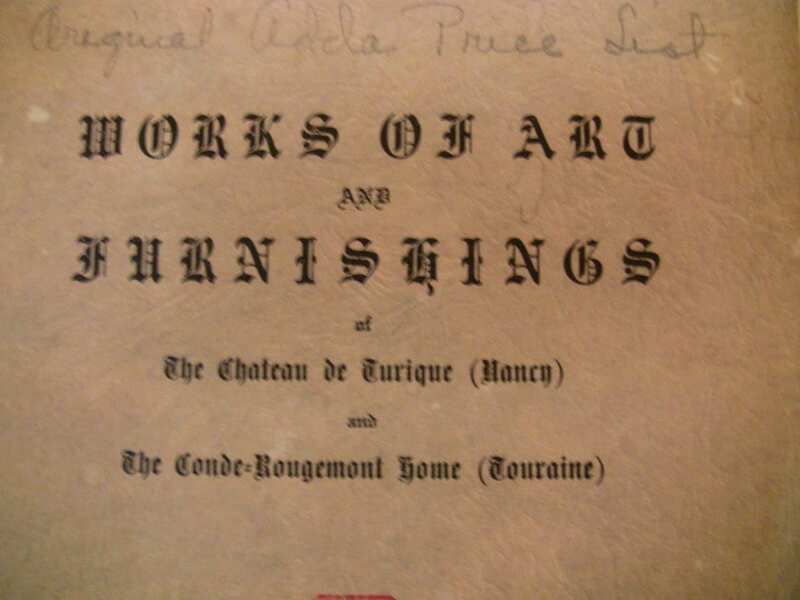 We have the Original Auction Catalog which has remained with the Commode since it was acquired at that Auction (along with other pieces in the Calvert Hall-Obenchain Collection on our Site). 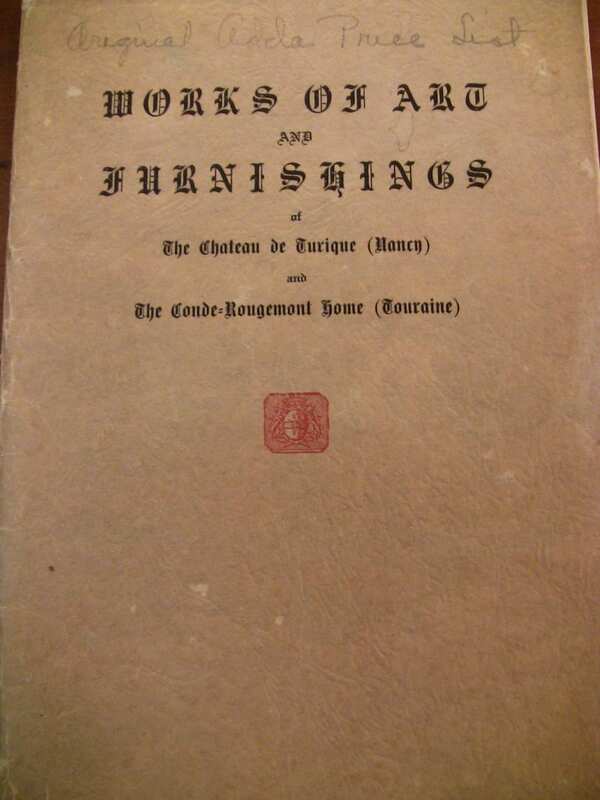 The Auction was titled: " Works of Art and Furnishings of The Chateau de Turique (Nancy) and The Conde-Rougemont Home (Touraine). The cover of the Catalog also has a seal of a Coat of Arms. The first page of the Catalog States: "Exhibition on Wednesday, April 2nd And Following Days From 10 A.M. to 10 P.M......EXHIBITION at CLUB ROOM, STONELIGH COURT, DALLAS, TEXAS". The Second page gives a brief description of the Auction contents and states that " This Exhibition will be presented by M. Fernand M. Adda of Paris France"
"Two Provincial Commodes....XVII CENTURY. On scrolling front legs fitted with two molded drawers. On the base a carved floral motoif. From de Tourique Collection." The catalog has a photograph of a Commode for Lots 195 & 196....but this Commode is ever so sligthly different from the one in the photograph....not having the escutcheons on the drawer fronts. Therefore, we are of the firm opinion and belief that the 2 Commodes in Lots 195 and 196 were not identical. We are of the OPINION that our Commode is from the late 17th Century.........circa 1690. Provenance: This Commode is part of the Lida Calvert Hall/Obenchain/Godwin/McMillan Collection......formerly of Highland Park, Dallas, TX. Condition: Overall in extremely good condition. Normal aging to the wood with beautiful natural patina. A copy of the Catalog will be supplied with the Commode. Some small cracks and crevasses in the wooden top, also some moisture rings, but in GORGEOUS ORIGINAL CONDITION. We would not change a thing! 17/18C French Provincial Oak Commode. Dimensions: . 31.5 in.high, 33.5 in. wide, 18 in. deep.